Posted on November 10, 2017 February 13, 2018 by Heather W.
Not long ago, Niagara Falls was known as the Honeymoon Capital of the World – thanks to the brother of a French dictator and a few other famous honeymoons – but today, it is one of the best places to go on a family vacation. Not only are attractions, eating options, and accommodations outrageously affordable, but the falls are educational and awe-inspiring. To cross a world wonder off your bucket list and take your kids someplace fun – without breaking the bank – look no farther than Niagara Falls. 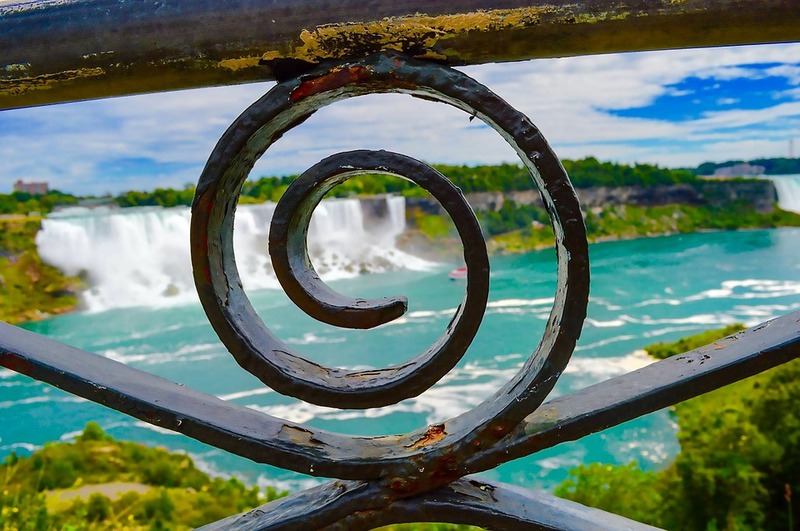 Perhaps the most difficult aspect of planning a family vacation is finding a destination that balances the educational with the exhilarating – and Niagara Falls does just that. There are a few boat cruises that take you around the Niagara River and up to the falls, but Maid of the Mist is by far the most famous and exciting. For $18.25 for adults and $10.65 for children (or $0 if your kids are under 5 years old) you can spend a half-hour learning about the Mighty Niagara and venturing ever closer to the base of the falls. You’re so close to the thundering water that you’ll get absolutely drenched – so dress appropriately. The Niagara Falls IMAX theatre shows an amazing film called “Miracles, Myths, and Magic” about the human history of the falls, but even more fun is the exhibit just outside the theatre. Featuring artifacts and stories of Niagara’s most notorious daredevils, the display is fascinating and fun – and a great break from exploring Niagara. Year-round, the Niagara Falls History Museum houses artifacts from Niagara’s long, diverse history and stories from its unique community, but the museum also has rotating events showcasing different aspects of the Niagara region. Plus, the History Museum has three sister museums that focus on specific aspects of Niagara’s history: the Battle Ground Hotel Museum, the Willoughby Historical Museum, and Lundy Lane’s Battlefield. Just $5 for visitors over 6 years old (or $15 for a family of five) you can learn everything about Niagara Falls and its people. Fallsview Buffet. A one-stop-shop for all your eating needs, the buffet offers breakfast, lunch, and dinner at a convenient location and an affordable price. Flying Saucer Drive-In. For an other-worldly eating experience – in which your kids will find familiar eats – this goofy themed diner is unbeatable. Zappi’s Pizza. A local favorite since 1971, Zappi’s has long offered amazing food at affordable prices. Plus, they have more than pizza on their menu. Sheraton On The Falls. With perhaps the best views of all Niagara Falls hotels as well as a tunnel to kid-friendly attractions (like Fallsview Indoor Waterpark) this is perhaps the best family hotel in the region. Crowne Plaza. A more historic accommodation, this hotel was built in the 1920s. Still, it offers outstanding views, amazing comforts, and kid-friendly amenities. Skyline Hotel. What this hotel lacks in outstanding views, it makes up for in proximity to a plethora of family-friendly dining options and attractions. If you find that you need assistance when planning your family trip, I highly recommend you connect with an online trip planner!